Born: December 9, 1863 in Sandwich Ma. Died: August 15, 1944 in Bourne Ma. 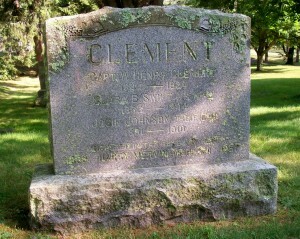 at 80 yrs, 8 mos, 4 d.
Married: February 8, 1884 in Sandwich Ma. To: William Henry Clement, Capt., Civil War; (1844 – 1924) (Isaac Clement & Achsah/Excy (Raymond) Hall); William married (1) Josephine M. Gibbs (1843 – 1878) (Phineas Gibbs & Ann Maria Cushman) in Sandwich Ma. on January 25, 1863. 2. Inez Newton Clement Robbins Gardner; (August 11, 1887 – August 1973); Married (1) Charles Allan Robbins (Abt.1885 – ?) (Alfred J. Robbins & Eliza A. Whitney) in Somerville Ma. on July 20, 1905; They were divorced; Inez married (2) Chester Pierce Gardner (1886 – 1963) George Frederick Gardner & Alice Smith Wellington) in Cataumet Ma. on May 9, 1915; Inez & her son Ernest Kellogg Robbins are buried in Cataumet Cemetery. 3. Harry Mervin Clement; (1889 – August 15, 1957); Harry died at 68 yrs, 6 mos, 13 d. & is buried in Cataumet Cemetery.